Often, osteoarthritis can be identified during a physical exam by a medical professional. By examining the knee and leg bones the cause of symptoms can be pinpointed. X-rays do not show cartilage but normal films can help rule out other problems with the knee that may have similar symptoms like fractures (broken bone), loose bodies or ACL injury. While not all of these tests are required to confirm the diagnosis, this diagnostic process will also allow Dr.Brighton to review any possible risks or existing conditions that could interfere with the surgery or its outcome. During knee replacement, Dr. Brighton removes damaged bone and cartilage and can replace it with an artificial joint made of metal alloys, high-grade plastics and polymers. For each procedure, minimally invasive surgical techniques are applied and Dr. Brighton may also employ computer assisted technologies. This allows for optimised patient outcomes. Knee cap is also referred to as patellofemoral replacement arthroplasty. The outcome of knee cap replacement can be good if the arthritis doesn’t progress and involves less procedural trauma offering speedier recovery times than a larger operation. The results can be less predictable when compared to total knee replacement as arthritis can progress over time to other parts of the knee. Some surgeons advise a total knee replacement as the results are more predictable, but that can be unnecessarily destructive if arthritis has not yet affected other areas. Unicondylar knee replacement (UKR) or partial knee replacement simply means that only a part of the knee joint is replaced, and through a smaller incision than would normally be used for a total knee replacement. In a unicondylar knee replacement, only the damaged compartment is resurfaced with metal and plastic. The healthy cartilage and bone in the remainder of the knee is left alone. While a partial knee replacement can be considered at any age, the outcome of the surgery tends to depends on the extent of arthritis, rather than your age. 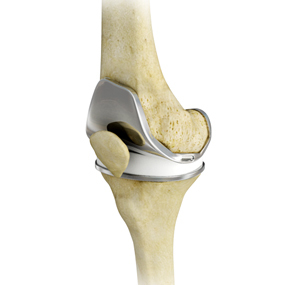 The artificial knee joint is made from a surgical-grade metal alloy with a special wear resistant plastic insert. Total knee replacement surgery is one of the most successful operations available today with over 90% still functioning well at 15 years. The procedure is usually recommended for older patients who suffer from pain and loss of function from arthritis and have failed results of other conservative methods of therapy. Total joint replacement can address patients with a greater range of arthritic stages and conditions. The decision to proceed with TKR surgery is a cooperative one between you, Dr. Brighton, family and other medical professionals. Dr. Brighton cuts down to the bone to expose the bones of the knee joint. The damaged portions of the femur and tibia are then cut at the appropriate angles using specialised jigs. The patella (knee cap) may be replaced/resurfaced depending on a number of factors and Dr. Brighton’s choice. Once Dr. Brighton decides that surgery is required, preparation is necessary to achieve the best results and a quick and problem free recovery. Report any infections to Dr. Brighton prior to surgery as the procedure cannot be performed until all infections have cleared up. Learn postoperative exercise (co contractions, leg lifts with the knee extended, etc.). Dr. Brighton will discuss any concerns you may have before any procedure. You may need up to 5 nights in hospital. After that, you can choose to move back to your own home and continue physiotherapy as an outpatient or be admitted for Inpatient rehabilitation which is now widely available. Crutches are required for 1 – 2 weeks following the replacement. It is usually a month before you have enough knee range and strength to drive. If any postoperative problems arise with your knee, such as redness, increasing pain or fevers, do not hesitate to contact Dr. Brighton. If unavailable, seek advice from the hospital or your doctor. Remember to arrange for someone to take you home, as driving is not usually recommended for a month. Recovery from knee replacement surgery will usually take about 18 weeks. Strong pain killers (such as Panadeine Forte, Tramadol or Targin) are usually only required for the first 5-7 days. Thereafter, regular over-the-counter Panadeine should be enough to control the pain (especially at night). If unsure about the exercise program after leaving hospital, a physiotherapist appointment will be required. The first postoperative appointment with Dr. Brighton is needed 4-6 weeks following surgery. A postoperative knee X-Ray is required prior to this review appointment. Continuing strength and range of motion training. Life gets pretty much back to normal with increasing activity. However, full recovery from knee surgery can be a slow process.